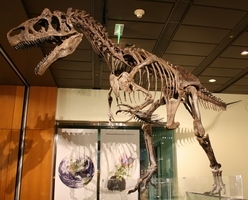 was one of the largest theropod dinosaurs and lived 112 to 97 million years ago in the Cretaceous period. The exact size of this prehistoric behemoth is under debate but recent finds and studies have suggested that Spinosaurus reached a length of 41-59 ft and weighed as much as 20 tons. It had an unusual appearance and is famous for the long, distinctive spines along its back. Spinosaurus was piscivorous, meaning that it ate fish, but it likely scavenged and fed on whatever it could find, including other dinosaurs. 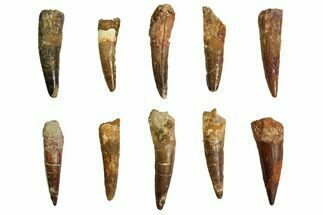 Recent discoveries indicate that is was probably semi-aquatic, not just hunting fish from the warm shores of the Cretaceous lakes, rivers, and tidal flats of North Africa, but also swimming and diving for its prey. Spinosaurus is believed to have primarily fed on large fish. 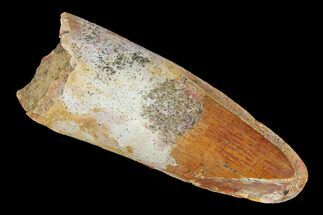 This is based on the elongated skull, spear-like teeth, location of the nostrils on the snout, and it’s habitat along the North African coast. Spines along its back, extending at least 5.4 feet long, suggest to some scientists a sail or humpback structure. Display, thermoregulation, and added weight for staying submerged are explanations for the structure along the spine. 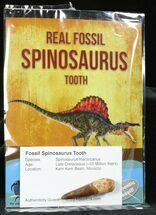 In 1915, the original fossil evidence for Spinosaurus was discovered in Egypt by German paleontologist Ernst Stromer. The fossil was destroyed by a bombing raid during WWII. A second species S. maroccanus has since been found in the Kem Kem Basin of Morocco. Spinosaurus appeared in Jurassic Park III, in an epic battle with T-rex. John R. Horner , a paleontology consultant for the movie, hypothesizes that T-rex may have scavenged for meals and that Spinosaurus was the ferocious predator. 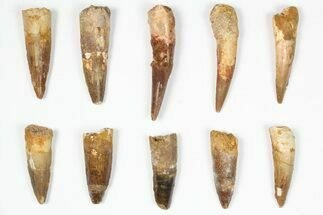 fossils are searched for in Egypt and Morocco. In Egypt, they are found in the Bahariya Formation. In Morocco, they are found in the Kem Kem Beds. 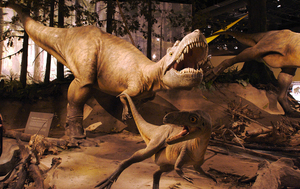 They lived during the Albian to Cenomanian time periods of the Cretaceous, specifically spanning 112 to 97 mya. Baryonyx, found in England, and Suchomimus found in Niger, are two species with crocodile-like skulls that are often referred to for comparisons with Spinosaurus. The neural spines, which were extensions of the vertebrae, grew to at least 5.4 ft long (1.65 m). They were 10 times in length than the diameters of the vertebrae they extended from. Their shape is distinctive from other described fauna. Both the fin-backed Edaphosaurus that lived from the late Carboniferous through the early Permian and the mammal-like Dimetrodon from the Permian had similar spines. Both had thin, rod-like spines that reached to the sky. Spines of the three-toed, herbivorous, iguanodont Ouranosaurus were thicker than Spinosaurus. The differences in the spine shapes between Spinosaurus and these very distinct animals suggest that Spinosaurus structures may also have a different purpose. However, Ouranosaurus lived a few million years before Spinosaurus, in corresponding habitats. 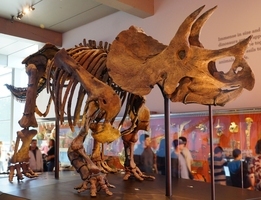 This supports a possibility of parallel evolution, hinting that species may have had different but similar structures that served the same ultimate purpose. While likely to have had skin between the extensions on the vertebrae like the sail-backed synapsids, some scientists argue that the spines of Spinosaurus are thicker, relatively shorter, and must have a different function. Supporters posit that these features are similar in purpose and design to those of hump backed mammals. In mammals, comparable bony structures can lend internal support to fat and tissue. Fat storage would be useful to survive seasonal fluctuations of prey availability- such as spawning or migration. The tissue and spines may have evolved for thermoregulation. Some scientists suggest that a membrane or tissue extended between the spines to assist with warming or cooling the body. Considering a buffalo-hump theory, insulating fat could have been useful in regulating body temperature while immersed in water and added to the overall weight helping it stay submerged. 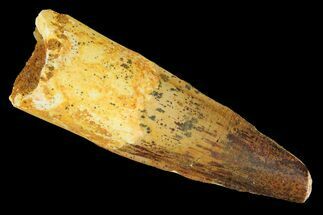 Other scientists suggest that the spines supported skin which made the giant dino appear larger or that some kind of pattern on the skin helped to identify individuals. The exact size of Spinosaurus is enormous, yet somewhat debatable. Definitive skeletal evidence is not as abundant as other large dinosaurs. One source suggests that there are only 6 partial but individual skeletons that scientists have for study. Discoveries of skulls are fragmentary and so skull shapes differ. 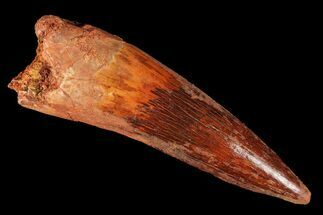 And with recently discovered limb bones that were much shorter than previous estimates many things about Spinosaurus are still up for debate and more study is needed. Based on the limited discoveries of the past the mass of Spinosaurus was estimated to be 8 to 9, and possibly 10 tons with a rare estimate in excess of 12 tons. But with the recent discovery of a more complete skeleton this estimate has increase to more that 20 tons for an adult Spinosaurus. This would decidedly outweigh the largest T-rex at 7.5 tons. These beasts were extremely hefty, appeared even larger than their actual tonnage, and their definitive size is still contested. massive, nearly 6 foot skull of Spinosaurus is narrow like that of a modern crocodilian. 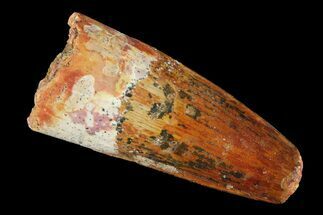 Spinosaurus fossil remnants are indicative of a semi-aquatic piscivore, (a fish eating organism). 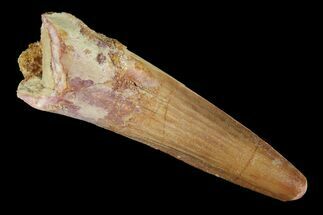 It had evolved lengthened jaws with conical, unserrated teeth, and raised nostrils. 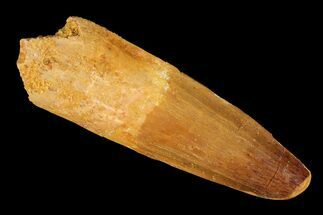 The semi-aquatic hypothesis is supported by isotope analysis of the teeth and a diet that included fish and land animals. Its secondary palate allowed it to eat and breathe at the same time. Crocodiles share this trait. Spinosaurus also shared the fish-eater trait of having less resistance of their skulls to applied torque when compared with obligate terrestrial predators. The overall impression of the Spinosaurus grin is that it looks crocodilian. The robust, front upper jaw possessed 6-7 teeth protruding from both sides of a narrow snout. 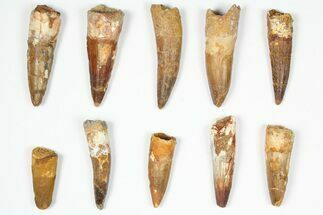 Twelve large teeth are located on either side, behind those of the premaxillae. Of the teeth at the front of the snout, the largest, second and third have a distinctive space behind them. This created a place in the bite for the large lower teeth. Weathered of broken fossil teeth are fairly common. 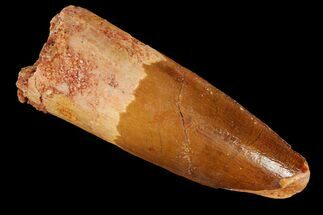 Large, well-preserved teeth over 3 inches long are rare finds. Fake teeth can be created by gluing together pieces of smaller teeth and hiding the evidence with painted enamel and rings of sand around the glued joints. 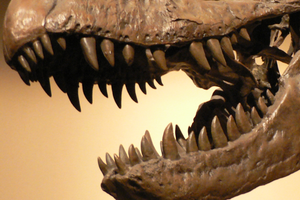 Restoration is not uncommon with dinosaur fossils. Honest professionals who carefully inspect fossils with the proper tools can identify the level of reconstruction. Spinosaurus lived among predatory giants of the Cretaceous. 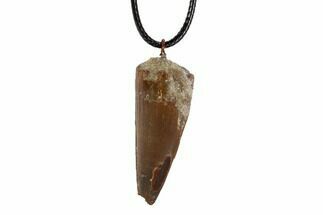 Its life history is constructed by examining the fossilized contents of its meals, and other fauna of its North African environment. Analogs have been studied that lived on the westward drifting South America, as well. Spinosaurus hunted among species of confounding size such as Carcharodontosaurus, and titanosaur sauropods. Spinosaurus may have defended itself from the 33-ft long crocodylomorph Stomatosuchus and from Sarcosuchus. Sarcosuchus was a 40 foot long, 10 ton crocodile that shared the aquatic habitat with Spinosaurus. Scientists assert that Spinosaurus occupied its niche in response to the other large predators in its environment- possibly altering its hunting area or diet preferences depending on shifting competitive pressures. While commonly thought of as a resident of modern Egypt, Morocco, and Tunisia, the contents of its stomach have been analyzed from specimens of related European and South American taxa, as well as from scale imprints found in the type specimen. These studies support the non-obligate piscivore lifestyle which included possible scavenging on land and a prey size that was selected relative to the size of the Spinosaurus individual. An insightful study in 2009, by Dal Sasso et al., revealed the possibility that pressure receptors were located in a cavity on the inside of the snout. Within this space, the receptors may have detected the communication of foramina that respond to movement in the water. In this manner, Spinosaurus would be able to detect unseen prey. 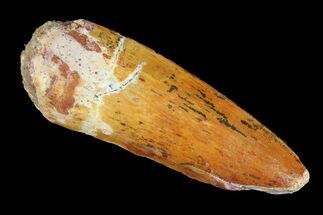 This hypothesis was developed from the results of x-ray tomography and is cited from the 1st International Congress on North African Vertebrate Palaeontology. Spinosaurid gait likely differed from other land dwelling quadrupeds. It was considered to walk primarily on its back legs, with some kind of occasional crouching posture. An entirely bipedal condition is challenged by the discovery of Baronyx, with its thicker, stronger forelimbs. The mass of the spinosaurid hump, depending on the tissue it supported, would have been significant. Now, scientists assert that Spinosaurus could have used its forelimbs like that of a quadruped when it was inclined to do so. 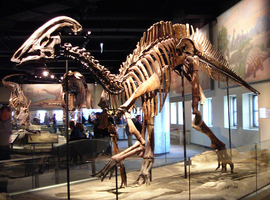 Theropods, including Spinosaurus, could not rotate their forearm and face their palms downward. Theropod prints of the Early Jurassic show that they could support some weight on the sides of their hands. This was a possible posture for Spinosaurus, as well. 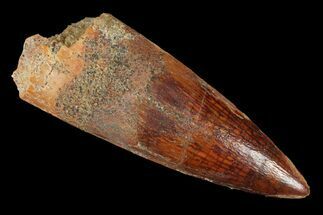 Though no Spinosaurus eggs have ever been found, the eggs are supposed to have been birdlike, and about the size of a mango. Spinosaurus, like other large theropods, was too heavy to lay on its eggs. Scientists suggest that they probably covered the nest with plant material. The gradual breakup of supercontinent Pangaea occurred throughout the Jurassic, and many continents were recognizable and separate by the Cretaceous. In the early Jurassic, Africa and South America lingered as one land mass. As the Jurassic progressed, North America separated from Africa across a narrow seaway, to the north. This seaway opened up to become the Atlantic Ocean. The African coast, where Spinosaurus lived in the Cretaceous, was largely equatorial, and the climate was hot and humid. By the Cretaceous, Africa and South America were separated from each other by the South Atlantic Ocean. This is relevant to piecing together aspects of the Spinosaurus life history by studying closely related species in South America. Other land masses were separated by seas such as a long band of ancestral Rocky Mtns, Australia/Antarctica, the Midwest/east coast of North America, and the giant landmass of Eurasia. By 94 mya, when Spinosaurus lived in North Africa, there was an enormous area of sea that covered the modern, north-eastern region. Egypt was suitable habitat for Spinosaurus. Its coastlines, tidal flats, and channels of fish would have been lined with mangrove forests. Large predators competed for food and seasonal changes may have influenced diet. 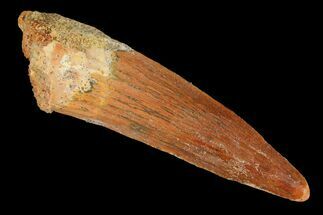 A tooth found in a South American pterosaur, suggests that in the dry season, Spinosaurus might have resorted to eating pterosaurs. The extinction of Spinosaurus would have been a different set of events than what killed the rest of the dinosaurs 65 million years ago. As its environment dried up during a change in climate, dwindling habitat would have reduced prey and increased competitive pressures among other large predators. Spinosaurus may have been too specialized for an aquatic habitat. A loss of this kind of habitat would have devastated its population even with a diet that didn’t consist solely of fish.